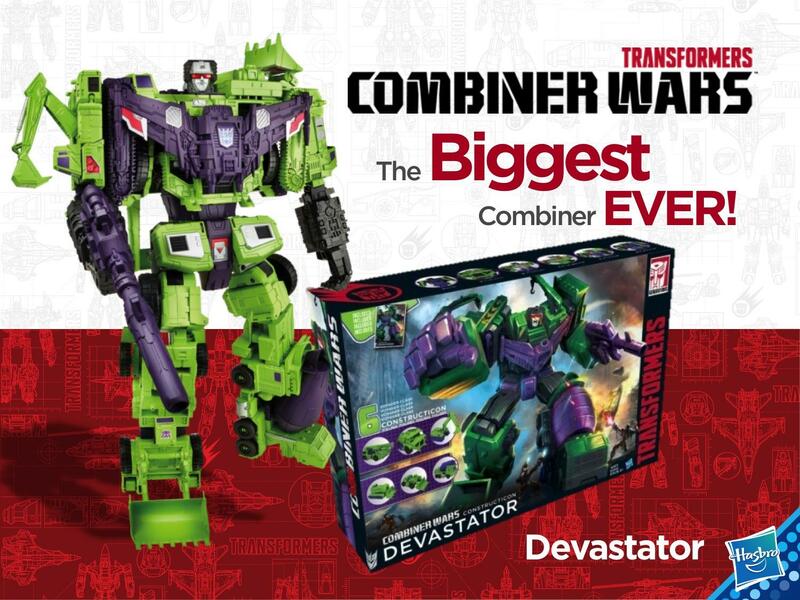 Why do I get the feeling they used a little dude, to make Devastator look even bigger? This just makes me want an MP Dev even more. Wow, the purple plastic on their sample looks horrible. Just got the BBTS message today that he should be in stock with in 10 days and shipped, so no store hunting for me on this one. Wait, what now? BBTS has been so damn annoying with getting things in stock in the past, I wouldn't be surprised if it wasn't in till September. Try imagining Christopher Walken saying this. Holy shitballs Longhaul is huge! Since I'm going to have to import it if I get it, I'll get TakTomys nicely jointed version instead (articulation FTW) If I get it, which I might even though I wish it was the same size as the other combiner wars combiners. Cool Video, but how many time can we say "Transformers Combiner Wars Devastator" in one video?? Any review videos from peaugh yet on this BIG guy?? WHOA! Hows he doing that with his hands!? Oh, never mind: "Fast motion used". I thought for a minute he had cracked the Matrix. Oh well. Mixmaster is the size of that dudes face! I cannot help but feel having an adult demonstrate this figure is more appropriate to the actual eventual buyer. Omfg a collector"s card???? Bought. You do realize they use a similar guy to promote ALL their toys in these videos? Even R.I.D. But I'll echo your sentiment: I'm not sure how to feel about this toy without a small child behind it, showing me the future enjoyment! I don't think it helps that they put mixmaster back to front when they displayed all the vehicle modes. Man, that Hasbro jingle at the start is this close to the scene transition music from the G1 cartoon. Sure does look nice in that vid. WOW! The forgot to fill in the forearms. And bend the elbows the right way. You'd think with such an expensive toy for both us and them, they'd take a little more care to pose and fully transform him to try to sell him. should be here within next 2 weeks! Wow. He sounds soooooo excited. Woo!